It’s very easy to stand still with music. You can find a comfort zone in the first flush of success and stay there forever, trapped behind the glass. Nick Ellis, who launched his debut solo album this week in Liverpool, has smashed through such false windows over the last couple of years and delivered on that force with a great record. But it’s the way he changes the spirit of a room when he picks up his guitar and sings his songs that really moves you. By Alan O’Hare. Great artists get better with age. It’s not fashionable, of course, and we all like to freeze our heroes in that time when they either first moved us or moved us the most. But it’s tough to argue with the fact that it’s the true seekers who improve with each passing year. You want evidence? Let’s look at Paul Weller and Kate Bush. Weller is like a shark that nature won’t allow to stop moving. Sure, there have been missteps, but they were made honestly and on the way to another triumph. There’ll be many reading this who yearn for a (proper) reunion of The Jam and who think that Weller’s best work remains that first flush of fire and fury in his formative years. But they’re wrong. That’s your time… the rest is his and the body of work closer to the front of the rear view mirror – work that doesn’t negate the early success, by the way – remains his most complete. It’s similar with Kate Bush, an artist who takes longer to present her work than Jose Mourinho takes to admit he’s wrong. Bush has been on a mission ever since her record company rushed her into a record at the start of her career, and that mission has remained to strive to get better with every song and make the most magnificent music that moves her, first, before anyone else even gets to hear it. 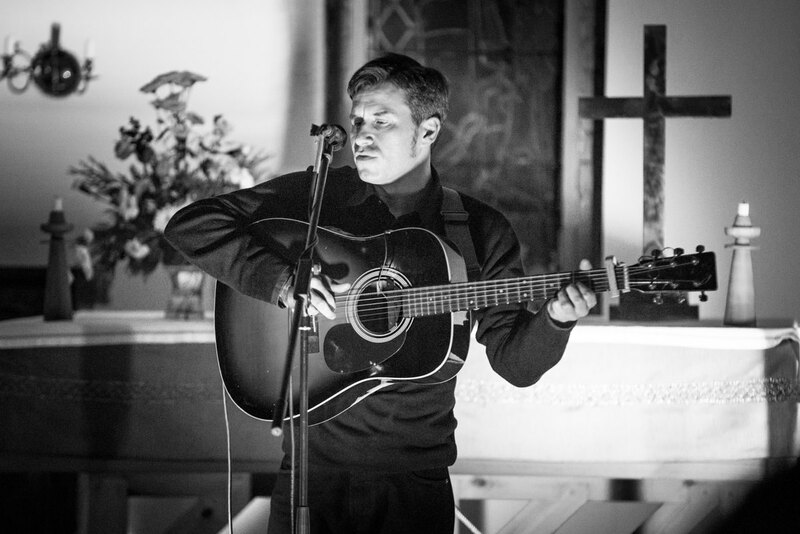 I was thinking of all this as I sat transfixed by the transformation of Scouser Nick Ellis, at his debut album launch inside the wondrous Gustaf Adolfs Kyrka (Scandinavian Seamen’s Church), last Saturday night. Ellis first came to prominence, locally and further afield, as the singer in The Maybes? a decade or so ago. But it might as well be a lifetime ago, as this is a singer and songwriter who knows what it feels like to be born again. His dedication to both crafts flows through the room like the late evening twilight that accompanied the 100 or so of us who’d walked up Park Lane earlier. We were there to celebrate the launch of his debut album, ‘Daylight Ghosts’, a record that invites you into its world and shows you straight to the back streets of the singer’s soul. Live, it’s no different. The second he wakes up that big boned guitar and starts coaxing reverberations from its wood and steel, the room changes. Intricate guitar work and effects-laden landscapes build the walls behind these songs of perpetual motion and the likes of ‘The Grand Illusion’, ‘Carillion’ and ‘St David’s Day’ are all carved from the same tree. It’s these big hitters that create an atmosphere that rises like the river on the horizon as you walk down Upper Parliament Street – but it’s not just Liverpool that inhabits these songs. The ten-a-penny, La’s-loving Liverpool songwriters that Ellis often gets lumped in with may see their work suffer from parochial concerns, lyrically and musically, but this is an artist with his aerial up. ‘Lovers In July’, sounding like it was written with Joe Boyd looking over the shoulder of the ghost of Nick Drake, alongside the Sam Cooke-esque fifties pop ballad of ‘My Old Flame’, confirm the genre-defying talent we’re talking about. But the fact remains that it truly is a Scouse soul that informs every breath, chord and thought here. Highlight ‘A Walk Through The City’, an oscillating lament twisting on a state of grace, stops time in the Scandi and is the song Lee Mavers should be writing in 2016… but who cares? Ellis is here, present and in danger of becoming the best this town has to offer with six strings and a melody. * A word, too, on the solo spot from Cousin Jac’s Jez Wing that opened the night. Just back in town from another US tour behind the keys for Echo & The Bunnymen, the piano man delivered a strong showcase for his forthcoming second record with a set of mostly new songs that captured hearts and minds, as well as attention spans.